A primary wastewater treatment plant was due to renew the contract to process the sludge and dispose of the bio-solids it produced. A risk assessment was required as part of the development of the bio-solids strategy for the plant and as an input to a Board paper to support the renewal of the contract. Commercial and operational constraints limited the time available for preparing and conducting the assessment. This case illustrates a straightforward assessment process, highlighting factors that enabled successful outcomes in a short period. The owner of a primary wastewater treatment plant (WWTP) employed a contractor to process sludge and dispose of bio-solids produced in the plant. The contract, which included a requirement to beneficially reuse the bio-solids on agricultural sites, was due for renewal. The WWTP owner wanted to test the market to identify whether other more suitable uses of bio-solids might be available. The incumbent contractor would be allowed to tender for the new contract. An investigation of options for bio-solids treatment and reuse had been undertaken and an initial draft strategy paper had been prepared. The strategy had to be finalised and approved by the Board well before the end of the current contract to allow time to invite Expressions of Interest (EOI) from industry. The WWTP provides primary treatment of wastewater (Figure 1). The concentration and stability of pathogens (outlined in Table 1). Government regulations determine what reuse is permitted, depending on the contaminant grade and the stabilisation grade. 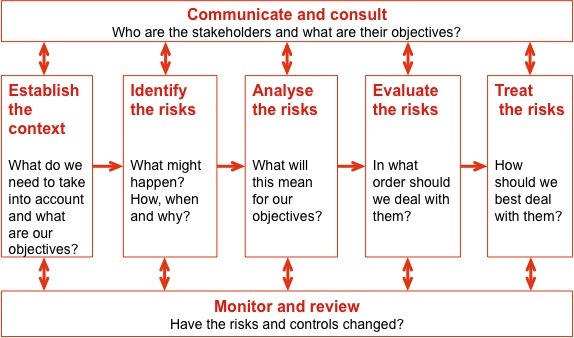 The approach followed the process described in ISO 31000 Risk management – Principles and guidelines (Figure 2). The context was established before the risk assessment workshop and used to generate a briefing note. The workshop covered risk identification, analysis and evaluation. Risk treatment would be included in the development of the bio-solids strategy and finalised for the Board paper. The 85 stakeholders identified during the context preparation fell naturally into four groups, summarised in Table 2 with their principal objectives. These were used to develop criteria against which the consequences of risks could be compared during the risk assessment, summarised in Table 3. The criteria were then related to the consequence scales used in the WWTP owner’s corporate risk management framework. A set of key elements was created to structure the workshop agenda (Table 4). An initial risk register of 80 items was prepared, based on material from earlier related assessments at this and similar sites. This formed a starting point for risk identification in the workshop. Consequences and likelihoods were assigned to each risk, and a level of risk was assigned. At the end of the workshop, the initial risk analysis outcomes were reviewed to ensure they were consistent and reasonable. 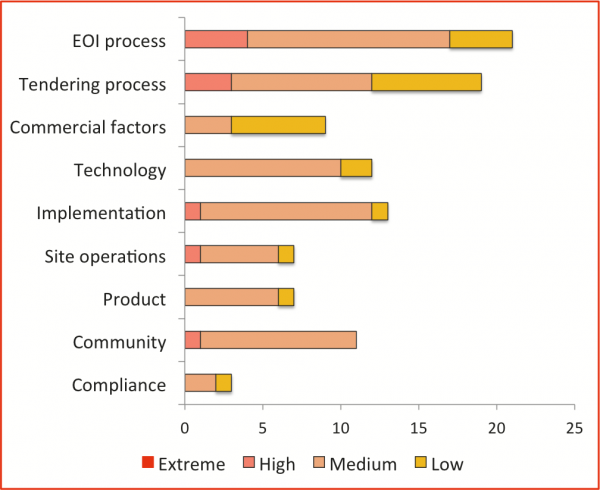 In all, 107 risks were identified, of which none was rated as Extreme and 10 were rated High (Figure 3). The High risks were addressed by the company in the Board paper, with the others to be addressed as part of preparing EOI documents as time and resources permitted. Potential community and media sensitivities associated with any changes to operations on the site. 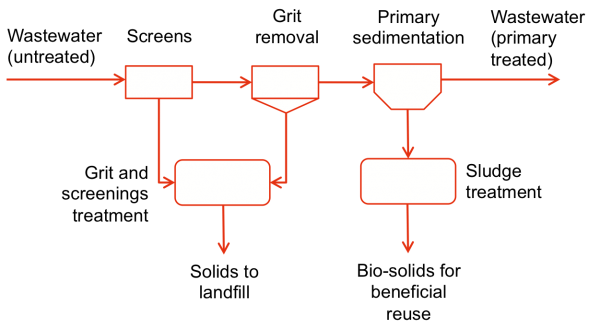 It is possible to complete a sound risk assessment in a tight timeframe. Several things allowed this to happen. The ability to reuse relevant information from earlier risk management activities was important, including, in this case, material from the site’s Risk Management Plan and the draft bio-solids strategy. The breadth of information available enabled relevant context information to be extracted easily and a briefing note to be prepared quickly. Risk assessments at this and similar sites had been conducted, some relating to bio-solids and some to contract extensions similar to this one. The outcomes from these assessments were used to assemble an initial risk register for the workshop. Having an initial register allowed the workshop to be conducted more quickly than the site personnel expected. The fact that an extended workshop was not needed ensured greater availability of key personnel with appropriate expertise to cover all aspects of the key elements in Table 4. All of the participants in the workshop were aware of the bio-solids contract and the need for speedy approval by the Board, and many had been involved in developing the draft bio-solids strategy. The knowledge of the participants, complemented by the detailed briefing material from the context activity and a sound straightforward process, allowed the workshop to be conducted efficiently and effectively. External facilitation contributed to the smooth conduct of the workshop, by removing any organisational or functional biases and avoiding any perceived internal ‘political’ agenda. Broadleaf’s experience with this particular organisation and the professionalism of its site managers and personnel suggests that this was only a minor benefit in this case, but in other places we have found external facilitation to be an important contributor to encouraging professional engagement and maintaining focus in the workshop, reducing debates about extraneous matters and obtaining consensus quickly. The outcomes from the workshop had many practical benefits. The risk assessment, and particularly the risks rated High, contributed directly to the finalisation of the bio-solids strategy. This was a critical part of the material presented to the Board to inform its approval decision to go ahead with a new contract. The urgency associated with the contract renewal and Board approval raised the priority of several matters in the SRMP and forced them to be scheduled earlier than might have been the case otherwise. This allowed the completion of the SRMP to be accelerated. The Medium and Low risks identified in the assessment contributed to the detail contained in the EOI documents. This provided specific information and background context for prospective tenderers, as well as indicating to them what matters the contract sponsor regarded as important. Both of these factors would contribute to better informed and hence more appropriately focussed responses from industry, and ultimately to a better contract and better operational outcomes.